Some of the public houses around the country feature ducks and other wildfowl in their names, examples include "Dog and Duck" or "The White Swan". Here are some reviews of the establishments we have visited. 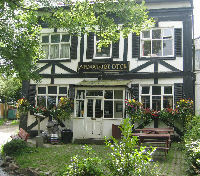 If you have a local pub named after ducks please feel free to write us a review. The Golden Goose is located on a road named Wild Goose Lane, although this is really just the entrance to the car park. We called in for lunch on a Tuesday. We were a little confused as the pub was nearly empty, yet every table had a reserved sign. It turned out that they do this to ensure you ask at the bar and are then seated by a waitress. The offers a carvery along with other meals. There is a salad bar and every meal includes a bowl full of self service salad. We found that we had nibbled away on most of our salad before our meals arrived. The problem with this is that the food does not come with salad, so having eaten most of it my burger and chips looked a little unexciting on the plate. During our visit there did seem to be shortage of non carvery food, however the pub is really geared towards carvery, and in retrospect I should probably have tried that. The deserts were far more impressive. There was a special price for two deserts, which was a good deal for an even number of people, however there were three of us and it was proportionally more expensive to order one desert rather than two. There was a large wickerwork duck adjacent to the salad bar. The Strawbury Duck is located next to Entwistle station in Lancashire, and can be found at the end of a single track road which winds its way over a lake before finally reaching the pub. We called in for lunch one Friday, and were treated to some excellent food. They even have their own beer, brewed by the Bank Top Brewery to enjoy with it, although other real ales were also available. Most of the walls were covered in photographs of various ducks. Things to look out for are the "Duck" and "Drake" signs on the toilet doors.